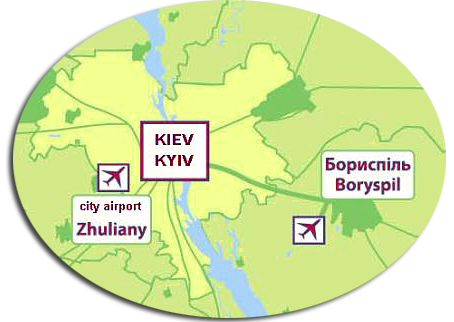 Kyiv Zhuliany is one of the oldest Ukraine airports which used to be the main Kyiv airport until Boryspil was built. Afterwards only local flights used this old Soviet hub. Zhuliany airport has a superb location. Being within city limits it is only 8 km from Kyiv downtown and a very short drive from central train station which makes it a favorite landing spot for independent travelers. 1) Shuttle bus #9 will take you to Central railway station in 10 minutes for only 2,5 UAH. Why not use it if it’s possible to get somewhere directly? If you need to go somewhere else or to Kyiv downtown just take the shuttle bus or one of other busses to central train station and then continue by metro. Tickets cost 1,5-2 UAH and are to be bought from the driver. You can also check out this great transport route planner to find your own way by public transport on your own. Negotiate with drivers but don’t pay more than 50 UAH to Kyiv center (let’s say Khreshchatyk street) and 30 UAH to central train station. Tip!!! Another hassle free option is to simply ask somebody to call and order a taxi with the meter. “Absolut” taxi offers some of best prices in the city for only 2,80 UAH per km with minimum order limit of 30 UAH. Dial 363 from any mobile phone and receive an immediate free call back. Here are taxi numbers in other Ukrainian cities.